Improved ability to localize sound, making it easier to know the direction of a honking horn, alarm, etc. 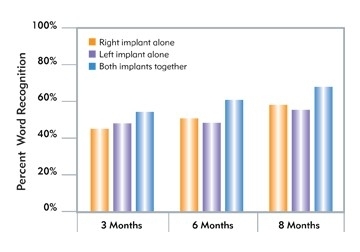 This Advanced Bionics white paper discusses how advancements in technology can have the potential to add significant benefit through implantation in both ears. AB offers additional documents and webinars that discuss the advantages of using cochlear implants in both ears, rather than one. 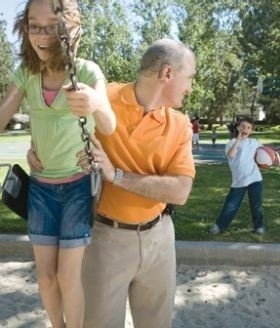 Binaural hearing is the optimal choice for your pediatric patients’ speech, language, and communication development. Stimulating the hearing nerves in both ears early in a child’s life may improve their ability to listen, talk, and learn along with their normal-hearing peers. 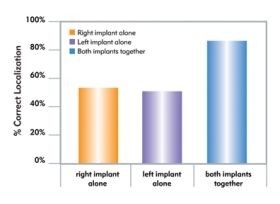 Adults with cochlear implants can understand speech better with two implants compared to listening with one implant alone – even in quiet settings. From romantic dinners to parent-teacher conferences, bilaterally implanted adults recognize more spoken words. Two cochlear implants help adults interact with friends and business associates at noisy restaurants or clamorous parties. Adults who use two cochlear implants hear much better in noise compared to those with just one. From ambulance sirens to honking car horns, two cochlear implants help adults more accurately determine where sound is coming from, just like their normal-hearing peers. 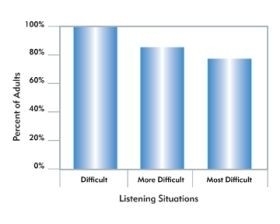 The Listening Room™ is a one-of-a-kind website that gives your patients a foundation of interactive and uniquely designed, FREE practice activities in English to improve their listening skills so that communicating with others is a successful experience.